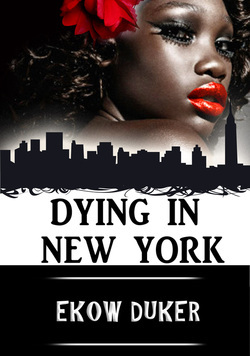 A long time ago, before I had breasts, sense or a husband, I knew one day I would die in New York. I must have been no more than ten years old and the jacaranda trees were about to burst into their lilac colored song. I'd never been to New York. Actually I'd never been out of our northern Johannesburg suburb, except for my monthly visits to Doctor Sydney Malema. You see I didn't go to school, not to normal school anyway. Not anymore. My condition, as my father always described it, was extremely delicate. I remember my mother would nod her head in agreement and do her best to avoid looking at me whenever he said this. You see, I was the problem. Even the dirty mongrel in the backyard knew this. Her fur would stand on end like the bristles of a toilet brush and she would growl menacingly at me. I just didn't belong. Every afternoon I sat by my bedroom window and watched the other girls skip past in their tangerine colored uniforms. They all attended the Mission School down the road. The school was run by white nuns who dressed in stiffly starched, grey khaki every day of the year, no matter how hot or humid it was. I’d sit and watch the girls go by until the last one disappeared around the corner. It was always the same girl who brought up the rear. She was dark with short, spindly legs that looked barely strong enough to support her body. Sometimes she would look my way and wave shyly. But only if no one else was watching. You see, the girls weren't supposed to talk to me in case my "condition" somehow leapt across the driveway, over the crumbling wall and infected them. One evening long after the chatter of the school girls had faded away, I was sitting by the window alone in my chair. We had an upstairs, downstairs house and from my window I could see over the tops of the jacaranda trees and as far as the Johannesburg CBD in the distance. The sun had lost its footing in the sky and was tumbling fast below the horizon. A lone mosquito whined around my head, complaining bitterly about something or other. I wanted to tell it I had enough problems of my own, but I didn't. My father would just say I was crazy because only crazy people talked to themselves. Or to mosquitoes. Just then a car pulled up to our driveway and its headlights shone parallel yellow beams into my bedroom. The chain fastened around my ankle glistened as if it were made of burnished gold. The other end of the chain was bolted to a heavy ring buried in the wall. Sometimes I rattled the chain and spoke gibberish just to annoy my father. He was a little afraid of me. I could tell because sometimes he armed himself with a wooden crucifix when he came into my room. He hadn't come to my room ever since the night I bit him in his private place. I was only ten and not supposed to know about these things, but I couldn't help wondering what he’d told my mother afterwards. Maybe he told her the dog bit him. Now that would have been weird. I waited a few minutes then crawled across the wooden floor. I went as far as the chain would let me and placed my ear against the floor directly above the living room. I could hear my parents speaking to someone called Sister Daniella. I’d been out of school for so long I didn't know she was the new head of the Mission School. Her voice fascinated me because she seemed to speak in perfectly modulated sighs. It was the sound a butterfly would make if it could speak. I heard her telling my parents she was from New York and that was when the idea of dying in New York stuck in my head. I didn't even know where New York was, but that didn't matter. It was a different place and it was new! That was enough for me. Mind you, I didn't want to live in New York. I’d already done more living than most women five times my age. I'd certainly done more living than my mother. "My daughter's condition is extremely delicate," I heard my father say in his solemn, made-for-visitors voice. I imagined my mother sitting next to him, nodding her pretty head and wringing her hands anxiously. "Let me get straight to the point," said Sister Daniella. "Lerato's not been to school for more than nine months now. Obviously, we're very concerned." "As we are," countered my father smoothly. "We may not be wealthy, but we love our children as much as anyone else." I could hear a trace of annoyance in my father's voice. I was puzzled because I'd not heard Sister Daniella say "no" to him. My father always got annoyed when I said no. Maybe she had said no and I just hadn't heard her. The chain chafed around my ankle and I readjusted my position on the floor. Sister Daniella changed tack. "May I see Lerato?" "I'm afraid not. As I told you her condition is very delicate. It would also be against our culture for a stranger to see Lerato when she is so... unwell." I could sense my mother nodding her head vigorously like a pretty flower bobbing in a stiff breeze. "I just want to reassure myself that she's all right." "And I assure you Sister Daniella, Lerato is as well as can be." The annoyance in my father's voice had taken on a hint of menace. I wondered if Sister Daniella was as afraid of him as I’d been the first time. I liked to think I wasn't afraid of my father anymore. I'm sure that was why he chained me up in my bedroom and took me out of school. Maybe if I hadn't looked him squarely in the eye while he grunted away on top of me, I'd still be at school. Maybe. "What exactly is wrong with Lerato?" I heard Sister Daniella ask. "She suffers from acute depression, not so Maria?" My mother hesitated before answering. I knew she was afraid of my father. She never dared look him in the eye the way I did. "Well that's what the doctor says," she replied with some difficulty. She didn't say that Doctor Sydney Malema was my father's brother. They both had the same stooped frame and gently rounded belly protruding above the elastic of their underpants. At least my father did. I'd never seen Doctor Malema undressed. "With respect, Sir, ten-year-old girls do not normally suffer from acute depression." "Ah, so you're a child psychiatrist as well as a nun." I imagined a mocking smile playing across my father's lips as he said this. "Actually I am," Sister Daniella replied firmly. Now there was more than a hint of steel in her voice and that threw my father off balance. I didn't know what a psychiatrist was but I could tell my father didn't like Sister Daniella at all. She was probably looking him squarely in the eye right now. "This isn't New York," I heard my father say. He was sparring with Sister Daniella now. "Surely you'll have no objection if I arrange for a social worker to come in and visit Lerato?" There would be a sheen of sweat forming on my father's forehead now, his sweat that tasted of salt and black pepper. "Let me remind you," my father cried testily. "You're in Africa! You're not in New York anymore." New York! The name thrilled me and already I began to fill it with songs and sweet rhythms. The songs my mother used to sing to me, long before I had breasts, sense or a husband. I could see myself walking all the way to New York. I hoped it was not too far. "What do you say Mrs. Malema?" Sister Daniella asked gently. It was hard not to be charmed by her butterfly-sigh voice but my father was 100% butterfly-sigh proof. He stood up abruptly and the legs of his chair scraped on the floor with an angry screech. "That's enough! Enough of your damned insinuation!" "Thabo!" my mother cried. "You can't speak to Sister Daniella in that tone." We both knew she’d get a beating tonight for talking back to my father. I didn't really care about that. She should have spoken back to him the first night he crept into my room and pulled up my night dress. As for me, I was going to New York to die.